And while he may spend nights sleeping on the cold concrete sidewalks of downtown Halifax, he would never pee there. What Smythe can’t find in downtown Halifax is a place to go to the bathroom. His bathroom visits are catch-as-catch-can. 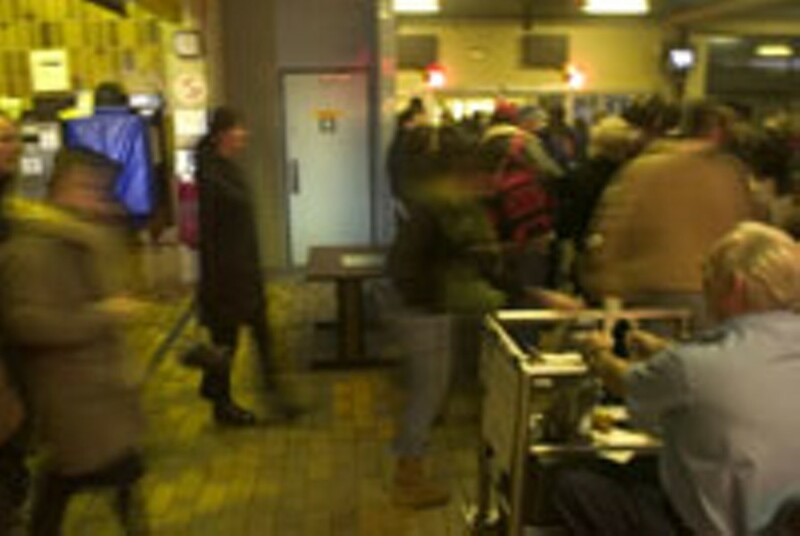 Smythe is a regular at downtown Halifax’s only municipal-run public washroom facility, inside the Ferry Terminal at the base of George Street. He visits the public washrooms at Bishop’s Landing, too, which are owned and maintained by the Waterfront Development Corporation. The Bishop’s Landing toilets are only open during the peak tourist months—May through October. As a last resort, Smythe uses the facilities at coffee shops like Tim Hortons. But he wishes he didn’t have to go into commericial spaces to pee. Greed is a professor of inclusive urban planning at the University of the West of England, in Bristol. For 11 years, she’s been researching what the British Toilet Association (of which she’s a member) calls “away from home” toilets—those for tourists, shoppers, public transport users, as well as toilets in the work place. Greed argues in her 2003 book Inclusive Urban Design: Public Toilets that you can judge a nation by its toilets. And in the public realm, lack of adequate, municipal-run toilet provision relates directly to how governments treat people—cruise ship passengers, white collar workers, homeless teens, women with kids, the working poor. Glares are only one small part of what’s wrong when it comes to toilet provision. Mat Smythe might consider glares a small issue too. Because at night, huddled against the wind in the cubby of a downtown Halifax storefront, glares are the least of his bathroom problems. At 8pm daily, the public entrance to the Bishop’s Landing public toilets is locked by a concierge. And at midnight—or 6:30pm on Sundays—the ferry stops running and the Halifax Ferry Terminal building closes. And along with them, downtown’s only official public washrooms. Everyone’s got a theory on public urination—that it’s a product of alcohol-fuelled bravado, a natural corollary to the increase in anti-social behaviour like graffiti, a throw-back to pre-civilized territory marking, or homeless people who are too lazy to move. It’s primarily, if not exclusively, men who commit the act. 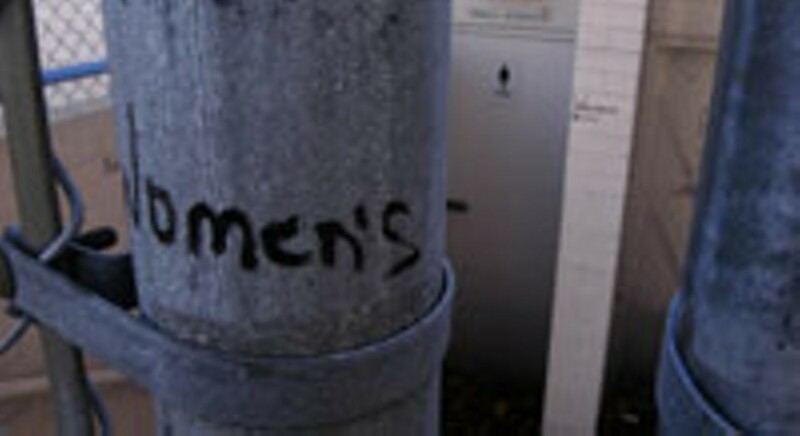 Does that mean women don’t have any problems finding a spot to relieve themselves? Enter Kathryn Anthony and the fight for potty parity. If you’re masking a smirk with your hand—or laughing out loud—thinking about a group of professionals spending a weekend talking potty, you’re not the only one. And if you think there’s nothing worth talking about when it comes to toilets, you’re probably healthy, disability-free and solidly middle-class with elderly parents or small children safely in the care of someone else. You probably aren’t one of the world’s more than 1.7 billion people—that’s two out of every five inhabitants worldwide, living mostly in rural India, urban China and sub-Saharan Africa—with no access to toilets at all. And you’re probably a man, who’s never given the line-ups of squirming women leading into ladies’ rooms a thought except to roll your eyes at whatever’s keeping your theatre date from getting back to her seat before intermission ends. And social factors: “Men just pull it out and do it, women have clothing to deal with; wiping—a lot of women blot, as they say, and don’t; and women are more likely to wash their hands after using the toilet than men. That’s not even counting the fact that women are primary caregivers for potty-training children, infants in diapers and for family members who may be elderly or disabled and need assistance using the toilet. The Nova Scotia Building Code has included potty parity regulations since at least 1985. The current ratio is 2:1 in buildings where the occupancy is 100 people or greater, according to Ed Thornhill, manager of permits and inspections with the Halifax Regional Municipality. But—big but—this potty parity ratio only applies to new and extensively renovated spaces. This is a boon to parents with children in tow who need larger toilet cubicles for strollers or who, in “regular” stalls, must undertake the impossible task of keeping their pre-schooler’s chest from rubbing against the outside of the toilet bowl as the two squeeze in. But for the spectrum of toilet users, one spacious barrier-free stall just doesn’t cut it. So while line-ups leading to women’s toilets are beginning to be widely addressed, the idea that the specifications for “normal” public toilets aren’t meeting people’s needs is rarely mentioned. The lack of 24-hour on-street municipal-run toilets, and what passes for that being OK in the eyes of many—the limited-hours toilets at the Halifax Ferry Terminal and Bishop’s Landing, and the assumption that independent business owners don’t mind providing toilets for anyone coming in off the street—is a frustrating fact of life in downtown Halifax for homeless people like Mat Smythe, fathers out-and-about with small children, pregnant teens and women in motorized wheelchairs. Need a more official summary of the problem? Turn to the three-volume Capital District Urban Design Project of March 2004. While not in the downtown core proper, the Halifax Common is part of the Capital District and governed by its planning schemes. And HRM has a public bathroom there. There are over 40 national toilet organizations around the world, in places like China, America, India, Russia and South America. In Canada there’s no central advocacy organization dedicated to the plight of “away from home” toilets. Here’s betting, though, if there were a Canadian Toilet Association, its members would have a field day learning about the public toilets on Halifax’s Central Common, AKA the Pavilion toilets off Cogswell Street. The Pavilion toilets (which are called that because the on-street bathroom entrances are below The Pavilion, an all-ages club which occupies the building’s upper floor) are part of the system of municipal-run public toilets that covers HRM in a spider’s web of recreation centres, emergency service buildings, sports fields and beach parks. There’s no HRM toilet map per se; what substitutes is a map available at halifax.ca showing HRM buildings—there are over 300 in all and about as many washrooms. There’s no HRM Toilet Department either. A composite snapshot of the 300-odd HRM toilets looks like this: 80 per cent are barrier-free; all are cleaned daily, with half of the cleaning outsourced; none are open 24-hours. A new washroom facility was built last year—with composting toilets—at Sandy Lake Park, off the Hammonds Plains Road, in Bedford. Another new toilet is under construction at the North Common off Cunard Street. The new North Common toilets will be an additional facility at this important urban park; the existing Pavilion toilets will remain in use. The Common is used by organized sports teams like those in the Metro Intermediate Baseball League and the Halifax Ultimate (Frisbee) Recreational League and by non-league sports players using the tennis and basketball courts, the skateboard park, the new play structure and the children’s spray pool. It’s also a popular dog park, frequented by runners and a well-used path of travel between Halifax’s downtown core and points west. The foundation has just been poured on the North Common toilets. The building should be completed, and the toilets ready to open, in May 2006. The new facilities will exceed the provincial building code parity ratio of 2:1, including one toilet for men and three for toilets for women. But on top of that, there will be an additional two urinals for men—making the new facilities an example of the kinds of toilets Clara Greed and Kathryn Anthony blame for women’s queues. One major benefit of the new North Common toilets is that they will be barrier-free; both the men’s and women’s washrooms at the existing Pavilion toilets are down flights of stairs, ruling them out for those in wheelchairs, some other disabled users, and adults with strollers. But even for many able-bodied Common-users, the Pavilion toilets were ruled out long ago. Finding the Pavilion toilets isn’t easy. There is no signage on the Central or North Common sports fields or courts, nor on any walkways, indicating where the public toilets (or any other amenities) lie. 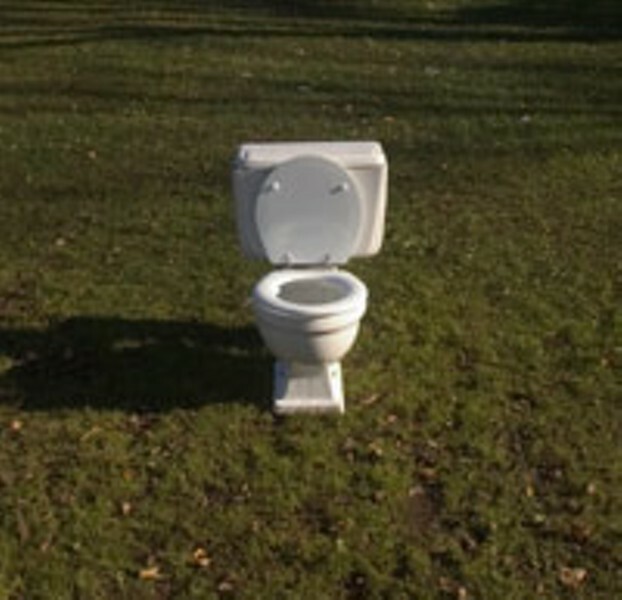 There is only one building on the Common, and it doesn’t take a genius to figure out the toilets must be in there. But even on the building itself, signage is meagre. The largest sign points out the entrance to the eponymous all-ages club located within; other signs read NO PARKING HRM AUTHORIZED VEHICLES ONLY and SPRAY POOL RULES: FOOTWEAR REQUIRED, NO DOGS ALLOWED, NO BIKES (hand-written in black marker). The two smallest? LADIES, on the north side, and MENS, on the east. There are no signs to tell visitors the hours the toilets are open, nor any indication where someone in need of a toilet might find relief if the Pavilion toilets were being cleaned or locked up for the day. They are locked, one bright, chilly autumn afternoon, with imposing chain-link fences squaring-off their entrances like cages. Down past the chained and pad-locked gates are dingy, poorly lit stairs leading to grease-smeared doors. Look left and the neighbouring skatepark is awash in sunshine and buzzing with skateboarders and BMXers riding the bowl. Across Cogswell Street the North Common plays host to handfuls of women and men chatting, running dogs and tossing Frisbees. It’s late autumn. School is out, work is finishing and there are a lot of people around. And there’s a muffled thump, too, against the Pavilion building. It’s two handball players, having a game against the south wall. These men they are playing their sport against the wall of a public toilet. We are having this conversation on a Wednesday, at 5:03pm. The doors are locked again when I check on Monday at 2:12pm. Same thing on the following Wednesday at 3:17pm, Thursday at 10:50am, Tuesday at 10:31am and on and on.